In addition, reports of unrest at the club revolved around a breakdown in the relationship between Mourinho and star midfielder Paul Pogba, resulting in a cocktail of despair for fans. The press were quick to point the finger at the Portuguese for United's issues, resulting in a backlash in which he demanded respect as he reminded journalists during a press conference that he had won three English top-flight titles. 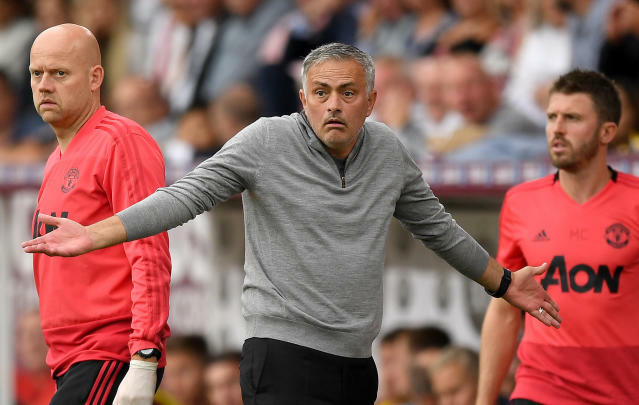 And while many fans have derided Mourinho for his behaviour, especially in the wake of his press conference 'meltdown', there are still sections of supporters who continue to back their boss. This was demonstrated in no uncertain terms by the plane that carried a banner above Turf Moor on Sunday emblazoned with the words 'Ed Woodward: a specialist in failure'. Manchester United return to action after the international break with a clash against Watford on September 15.